Over 100 Casino games available to play. Roll the Dice at Golden Cherry! 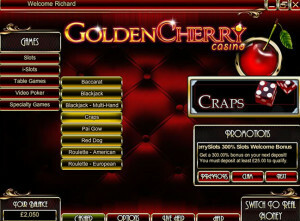 Golden Cherry Casino brings a different casino experience to US players – offering Rival Gaming software. The site looks great and is part of a bigger chain of online casinos. However with no bonus offers or loyalty schemes relating to Craps, does it offer enough to pull you away from your regular site? In this review of Golden Cherry Casino I start first with a brief overview of the company. 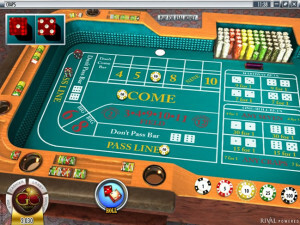 Then you can see what the Craps game there is like, with details on the graphics, gameplay and bets. Bonuses are covered next along with the other games you can find on the site. Finally you can find out about the banking options for this casino and their customer support. Who Are Golden Cherry Casino? Golden Cherry Casino is run by Netad Management, which operate a number of online casinos including WinPalace Casino and Slots of Fortune. The company is licensed and regulated under the jurisdiction of Curacao and opened in 2012. The site happily accepts players from around the world including the US. What makes Golden Cherry stand out is its one of the only US facing casinos using the Rival Gaming software. This provides players with a new set of games and a different experience at the Craps table. Golden Cherry’s games can be played in browsers via their Flash client or downloaded onto Windows PCs. Their Vegas style Craps game can be found under Table Games on both clients. The graphics for the Craps table looks really crisp and the table is clearly laid out. Unfortunately while the look is great, the sound is terrible. The croupier’s voice and satisfying sound of rolling dice is fine but there’s this weird mix of background noises buzzing constantly away. Thankfully this can be turned off in options. As you move the mouse around the different areas you can bet in are highlighted along with a note telling you what the bet is. A bet can be increased by clicking on the chip denomination then the area in which you wish to place your wager. It can be decreased by right clicking on the live bet on the table. Bet maximums are not clearly labelled although customer support explained it was $100. I was unable to get a clear answer regarding table limits, although if the Play money tables are set to the same limits it will be around $300. Should you go over both these limits a pop up will let you know. The Odds structure Golden Cherry uses is the 3-4-5 odds, which mean the game odds are more similar to real casinos than other online sites who just offer a straight 3x. Field bets pay out at even money apart from 2’s which pay out 2:1 and 12’s which pay out 3:1. Other bet odds offer standard pay-outs and if they are not displayed on the table, can be found under the Help button. New sign-ups at Golden Cherry casino can get a 300% match up to $3,000 for playing slots or 2x 50% matches up to a total of $888 for table games. There are also smaller bonuses running constantly for existing players. Unfortunately Craps wagers do not count towards releasing these. If you choose to take up these offers in order to unlock the bonuses you typically must wager 40x the total of the deposit and bonus amount. 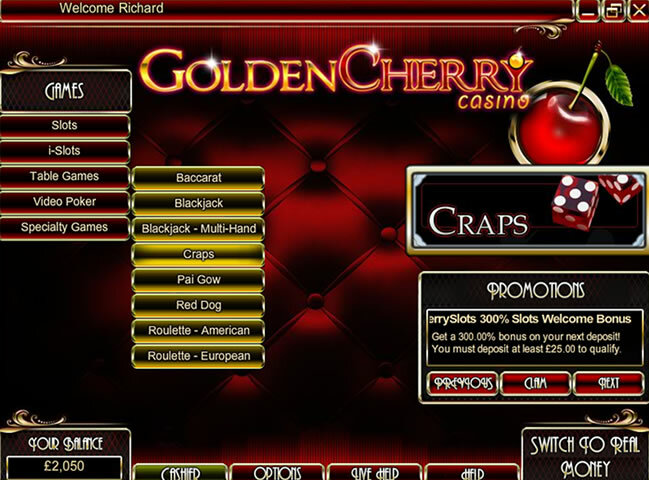 Golden Cherry has over 100 games in its casino library. Among these you can find many high quality slots titles which Rival Gaming excel at. You can also find the standard table games such as Blackjack and Roulette alongside other table game offerings such as Red Dog and Pai Gow. Golden Cherry offers a wide range of deposit options, although some may not apply in all countries. Credit Cards can be widely used however and deposits from $25 to $1,000 are allowed. In countries that permit them, e-wallets such as NETeller and Skrill offer fast alternatives. Despite deposits being allowed from $25, it is disappointing to see withdrawals are only permitted for amounts of $100 or more. Withdrawal methods are less clearly stated on the website, although generally you can either get money credited back in the same method you deposited or via check. There is a delay on the first withdrawal of up to 10 days while security checks are carried out and you have to complete the site’s ID verification program. The site’s customer support are able to help in most cases and are available 24/7 via Live Chat, email or a toll free US phone number. Response is quick although I was slightly concerned when the rep I spoke to started advising me on Roulette bets when I was enquiring about Craps. Players need to be aware that Golden Cherry has many recent reports of players experiencing major problems for attempting to withdraw winnings. The players have been forced to endure excessive delays to payments or, in some cases, no payments at all. These reports also incorporate sister sites such as Loco Panda Casino. The problems appear to have arisen from a large volume of players across the network, and operators have shown no willingness to reach resolution with mediators. For this reason, Golden Cherry has been blacklisted at this time until player payment issues have been resolved. Golden Cherry Casino offers a change with the Rival Gaming software, but has suffered by no bonus or loyalty incentive, lack of transparency, poor support and excessive withdrawal limits. In recent times, Golden Cherry was officially blacklisted after constant delays and failed payments to legitimate withdrawal requests from customers. Since they are now considered rogue, we highly recommend you take your cash elsewhere. No loyalty program or bonus. Now considered rouge due to ongoing problems with failed payments to customer withdrawals.